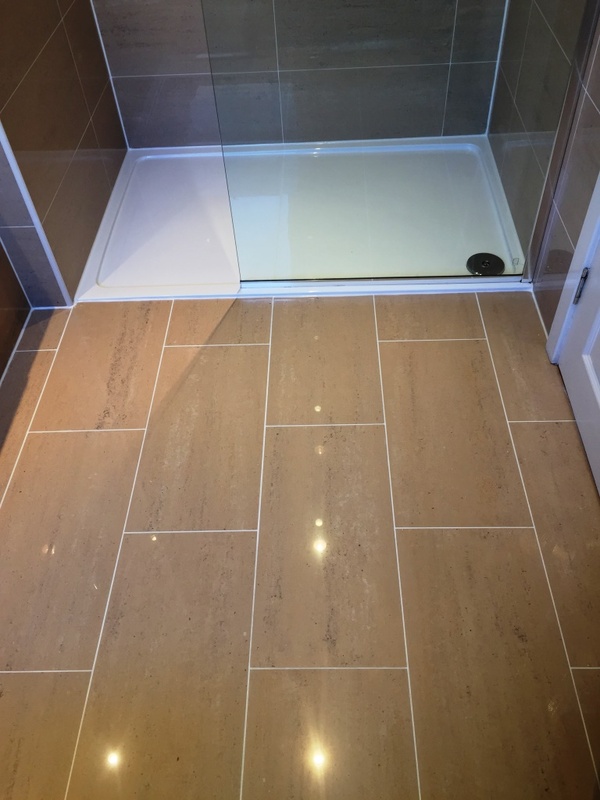 The Porcelain tiles in this bathroom installed at a house in the small village Inchinnan were in good physical condition but were looking dull and being let down by the grout which had gone dark in a number of areas. This is often the case with Porcelain floors which are very tough and generally out-live the life of the grout which has a porous top layer that is subject to staining especially from the dyes in personal products. To get the tile and grout really clean a strong dilution of Tile Doctor Pro-Clean was applied to the tile and grout and left to soak in to the surface for around ten minutes before scrubbing it in; the area was quite restrictive so this process was done by hand. The soiled cleaning solution was then then rinsed away with warm water which was removed by a wet vacuum and stubborn areas sport treated. The floor was then given a final wash with Tile Doctor Neutral Cleaner diluted with water to remove any remnants of Pro-Clean and then dried as much as possible. The cleaning process made a big difference to the Tile and Grout however there grout still showed evidence of staining. To resolve this we would have need to laboriously scrape out the grout and re-grout it; however this does take a long time and there is a quicker solution by using a Grout Colourant. Grout Colourants apply a thin but impermeable epoxy layer on top of the existing grout and come in a range of colours which is handy if you want to completely alter the look of your floor. In this case however the customer was happy to have the white original colour of the grout restored; two coats were sufficient to achieve this. Once done and dry we gave the floor another rinse with Neutral Cleaner and finished by buffing the Porcelain tiles with a white pad on a hand polishing machine which brought up the natural shine on the tiles. 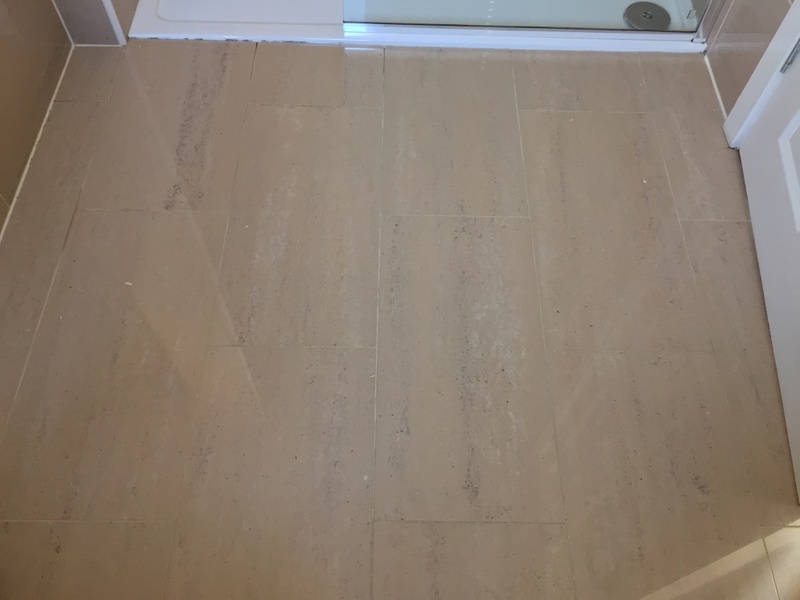 This entry was posted in Porcelain Posts and tagged bathroom tiles, cleaning porcelain floor, cleaning services, floor restoration, Glasgow, grout colouring, Inchinnan, porcelain tiles, tile cleaning, tile maintenance, tiled floor by AbzDominise. Bookmark the permalink. You made a big difference to the look of that bathroom, this is the sort of thing that helps sell houses.